Far out on the west side of Hidalgo County, the land is dark and rich and flattened into an alluvial plain by ancient floods in the Rio Grande Valley basin. 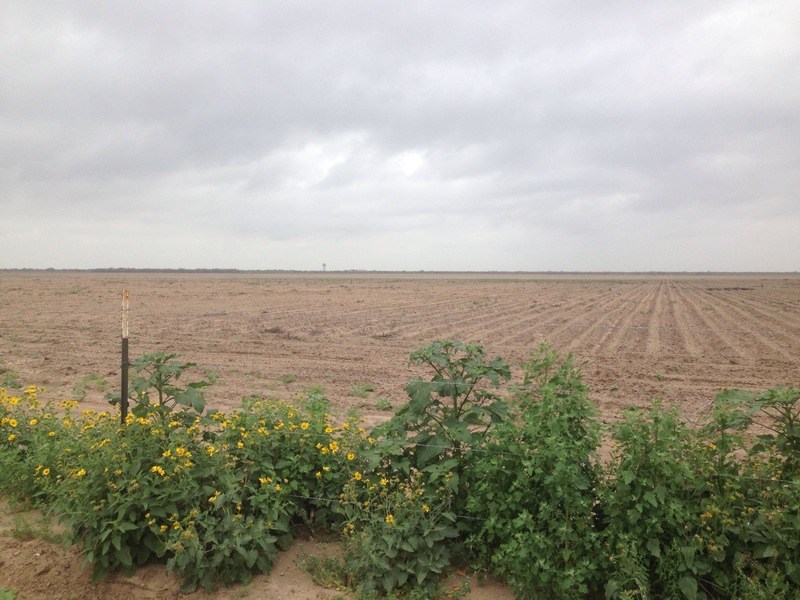 There is no end to growing season this close to the Mexican border and the fields are only barren between plantings. Crops, however, are not the only income producer for landowners in far South Texas. 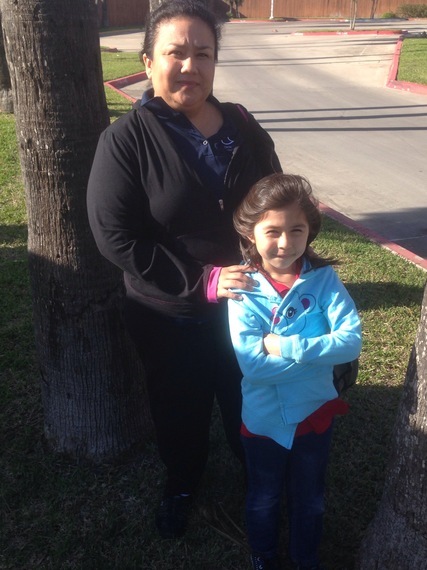 "We pay $375 a month for our lot," said Roberta Tovar. "We had to save up $500 for the down payment and another $500 to have the electricity pole put up. We owe $35,000 for a little more than an acre." Tovar and her husband Robert, and their pregnant daughter, live in a colonia, a privately owned and unincorporated neighborhood outside of the nearest city's jurisdiction. 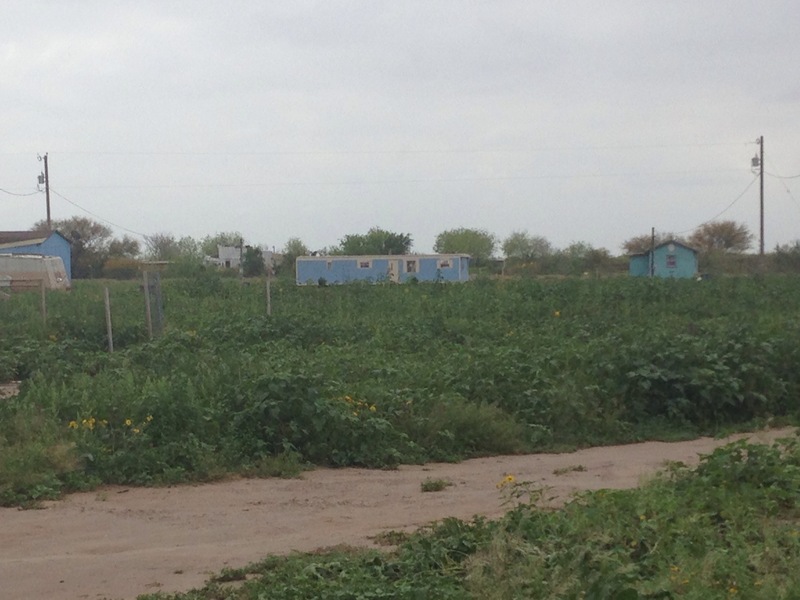 Colonias have long been the refuge of the poor along the border because they provide an opportunity to own property, but they also tend to be plagued with limited or no utilities and are often developed by unscrupulous landowners seeking easy profit. "This is where we live," Roberta said, as she pointed to a mobile home with aluminum foil on the windows to help keep down the heating and cooling costs. "We want to have a nicer place but my husband can't work now because of his blindness." Robert Tovar's diabetes has almost completely destroyed his vision, an outcome that was most likely avoidable with health care insurance and insulin. His right eye is completely blind and there is only fuzzy light in the other eye. "We didn't have money to pay for the insulin," he said. "Or any health insurance. So, it's completely black over there. Maybe sometimes I can see light or a little more on this side. But now I can't work." 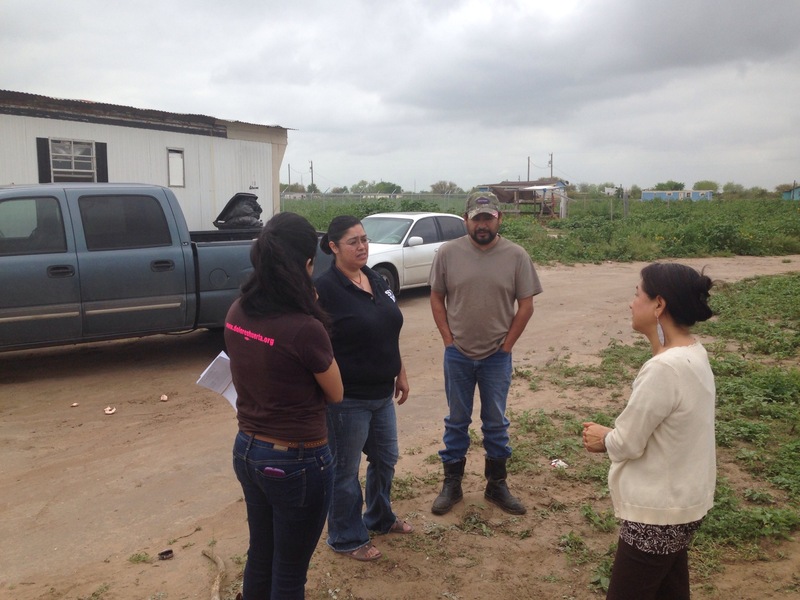 The Tovars were telling their story to Martha Sanchez and Yvette Salinas, social workers from La Union Del Pueblo Entero (LUPE), who had taken me on an impromptu tour of colonias. LUPE, an outgrowth of the United Farmworkers Movement, is organizing poor communities to vote and create social change. "People don't realize," Sanchez said. "These aren't undocumenteds living in the colonias. Most everyone here was born in the U.S. These are Americans trying to make better lives. We give them language services and help them get things done like get streetlights way out here where it is so dark." 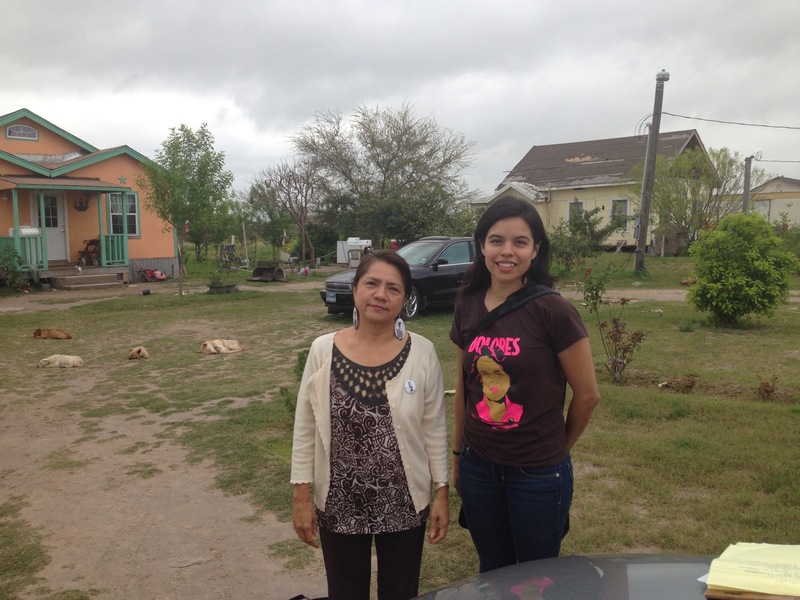 In Hidalgo County, it is estimated one out of every three persons lives in a colonia. There are believed to be 1200 of the neighborhoods in the Lower Rio Grande Valley. About thirty homesteads are going up in the Tovar's colonia, which has no formal name but was referred to by the young couple as Milagro. "Because I believe in miracles," Roberta explained. "I can move mountains. I know I can. I just have to work hard and believe. I write about it all the time. And I pray constantly. I'm starting a new job now and can take care of Robert and help our daughter, too, while her baby comes." Roberta began to cry as she tried to articulate her faith and going north with her parents to work in the fields as migrants. Robert and her were both born in the U.S. and have always struggled financially. He sleeps on the floor in the mobile home because their pregnant daughter needs the only mattress. Roberta is optimistic, however, because she is leaving her job at a convenience store and starting new work for $9.85 an hour at a big box department store about 30 miles distant, which she hopes will lead to health care. When Yvette Salinas of LUPE asked the Tovars if they were registered to vote, the response was enthusiastic. "Oh yes," Roberta said. "We will vote. There are important things like health care and education. We need lots of improvements down here. We know voting is important." She lives at the other end of the valley in the poorest spot in America. Of the 415,557 residents in Brownsville and Harlingen, 36 percent live below the poverty level, and 37 percent lack a high school diploma. The median household income, which has been declining steadily over the past three years, is $31,850 compared to the national figure of $51,371. But Paula Saldana is largely unfazed by circumstance. Which is important. Because she is raising four children, working two jobs, helping to put her husband through college, volunteer teaching two community health classes each day, and she cannot afford to purchase health care for her family. "My husband is registered at a community clinic for his high blood pressure," she said. "So, he can sometimes get treatment there. And my three youngest kids are on Medicaid. But my husband and I don't earn enough money to get the Obamacare subsidy and we also don't qualify for Medicaid. If the state expanded Medicaid, we would have insurance." Saldana sat across from me at one of those coffee shops where people sit all afternoon with their wireless devices and drink six-dollar milkshakes called frappucinos. The dramatic change in her life was the consequence of state laws making it more difficult for women to get abortions for problem pregnancies. Funding was eliminated for her job as a community health educator for Planned Parenthood, but she refused to quit the work and continued as a volunteer for the National Latina Institute for Reproductive Health, and every day in the classes she teaches as a volunteer, certified health educator, she hears from young women wondering what they can do and where they can go for help. "It's a very hard and sad situation," Saldana said. "But that same sadness and anger is going to pick us up. We are tired of losing resources and benefits. We don't want to be known as the poor city and region and the place with all the people with cervical cancers. We are going to keep on fighting to educate the community so our legislators can turn back and look at it and then they can do what's right." Saldana had been with Planned Parenthood for three years and had just purchased the family's first house when her job was eliminated by the state budget cuts and new regulations, which eventually closed the only clinic in the Rio Grande Valley that had been offering abortion services. The work she does now involves conducting surveys on tobacco use, going door-to-door, and as a community health instructor with Cameron County. And she is always ready to conduct volunteer classes. "We meet under palm trees," she said. "Or sometimes on someone's porch. The churches have also been good about opening their doors. I just learned so much with Planned Parenthood and I wanted to reach out to more people. I talk about health issues. But more health workers are talking about voting and education down here." Paula Saldana's commitment grows out of her own experience. At age 16 she became pregnant and was confused about her choices. Even with a supportive mother, she still needed to turn to planning services to help her understand options. She chose to give birth to her son and attended a high school established for pregnant teens. Twenty years later, if she were in the same situation, information would be more difficult to acquire and, had she made a different decision, the nearest abortion clinics are now 250 miles away in San Antonio or Corpus Christi. "Women are scared down here," she said. "They don't want to go to the emergency room. And it's just that horrible silence that kills you. You just don't know what is gonna happen, and we are just waiting for that story that a woman died for whatever reason or circumstance that she's living with; we are just waiting for that story and afraid for when it comes, but we know it will." On our way out the door, Saldana casually mentioned that her seven year-old daughter Ximena will be playing in the national chess championships for her age group in Dallas. Ximena had been sitting quietly nearby as her mother was interviewed and looked up to smile as we went to take their picture. The idea that people would give up on the political process, and surrender their children to an eventuality that might be avoided, was clearly what kept Paula Saldana motivated. "The people who ask about why vote? What for?" she repeated the questions. "What difference is it going to make? But we are turning things around. That reason you don't want to vote is actually the reason you should. If those votes didn't make a difference, then we wouldn't have the right for women to vote or Medicaid or Medicare." Change, she believes, still happens one vote at a time.